← How will we know when Satan is cast down? Sorry for the less than optimal sound quality. The little clip on microphone I was wearing picked up some background noise, so I had to use the audio recorded from the shotgun mic on the camera, which was sub par. Hopefully I’ll get the mic situation fixed for next Sunday. I think I’ll just go with a microphone stand. All relationships are built upon trust. Be that a relationship of a patient to a doctor, child to a parent, husband and wife, a person buying or selling; even our pets have a bond of trust with us. And if we abuse them then that bond is broken, isn’t it? Probably the most precious relationship is husband and wife. And how many marriages have been destroyed because trust has been broken? There’s also our relationship with God, and throughout the Scriptures we read that God implores us, command us even, to trust Him. Our having trust in Him is the same as having faith, really. Isn’t it? And that’s what God requires of us. You might wonder though, why it became necessary that we trust God. It should come naturally. But unfortunately it doesn’t. Most people are estranged from God; alienated, as the apostle said. Well, it all began back in the Garden of Eden, didn’t it? And the trusting relationship that Adam had with his Creator was ruined because his wife listened to this talking serpent. And, of course, we know that a spirit creature was behind the one who’s come to be known as Satan, the Devil. You know, in Hebrew, the word that is used for Devil, literally means a slanderer. This angel, this son of God, slandered his Heavenly Father, calling into question His Name, His motive: “Is it really true that God said that you must eat from every tree?” And then he went so far as to say “Oh, God knows that the day you eat from this tree your eyes will be opened and you’ll be like God, knowing good and bad’’. In other words, God was not trusting, He didn’t trust His servants; and therefore, they shouldn’t trust Him completely. He’s holding something back. He doesn’t want you to know as much as He knows. And so, that’s where it all that began. In fact, when Jesus was on the Earth, He said that the Devil was a liar and the father of the lie. Think of that, he invented the lie; no one had ever told a lie before. Of course, there weren’t any humans on this earth, but among the heavenly sons of God, who’d been around for eons, no one had ever told a lie. It’s amazing, though, when you think about it, the apostle said that it is impossible for God to lie. For some humans it’s impossible for them to tell the truth. What a perversion! What was to become of God purpose? He had, in effect, trusted Adam and Eve to fulfill His purpose. He only gave them a couple of commands; one, not eat from the tree, of course, but the other was to fill the earth, subdue it and have in subjection the fish of the sea and so forth, so and then God began resting, from all the things He created. And surely, His intention was not just to have two people alone living on earth or have a decrepit dying race; no, God trusted Adam and Eve to carry out His purpose. And, quite likely, the Devil saw how he could… You know it’s interesting that Satan did not call into question God’s power, because there would have been no contest, God would just… Gone! But he questioned God’s trustworthiness. And likely in the Devil’s mind, he saw that God had announced that He was resting, but if they eat from this tree they would die but He commanded them to fill the earth, but if he gets them to disobey God… what can God do? (5 minute mark) If he puts them to death, who was gonna fill the earth and then subdue it? If He lets them off the hook, God’s lying, He said He would put them to death. And if God lets them die and creates more humans, He breaks His own Sabbath —He said he was gonna rest. But, anyway, Jehovah announced, on that very day, His intention to produce an offspring of this mysterious woman who would crush the head of the serpent, and of course, at the time, nobody knew who the serpent was, but, of course, as I mentioned Jesus revealed him as the original murderer and liar Satan the Devil. And the reason Jesus could reveal him as such, is because He was the offspring of the woman, the promised one, and he was bruised in the heel, of course, when Satan had him put to death. But, going back, after the Garden of Eden, God allowed them to produce sinful, dying offspring knowing that He would ransom them from death through this promised Messiah. But, in time, others joined Satan’s rebellion, others in heaven that is, other sons of God. And Genesis chapter six says that they began to notice the daughters of man, that they were good-looking. They came down and took wives for themselves, all of they chose. Well, that went on for a while and then He put a stop to it. He caused the great Deluge and wiped them out, and forced these materialized sons of God, these angels, back into the spirit dimension, where they belonged. The apostle wrote about the angels that did not keep their original position, so… at any rate, God began anew after Noah and his family emerged from the ark and in time Jehovah contacted a man called Abram, and He put this man through a series of tests of his trustfulness, and in time He promised this man, Abram, whom he renamed, Abraham —“father of a multitude” —that his offspring would inherit this beautiful land of Canaan and that all the nations would bless themselves by means of his seed, his seed, the offspring that God promised in Eden who would crush the head of the serpent. But God required that Abraham prove that he trusted God. He promised that he’d have an offspring at the time he was childless and he was 100 years old and his wife had passed child bearing age as well; but he believed God. And, in time, Sara gave birth to Isaac, and Isaac grew up, he wasn’t a babe, when God required this unimaginable test. He told Abraham I want you to take your son, your only son, Isaac, and sacrifice him to me. Tough test for any parent… but Abraham did as Jehovah commanded; He took the wood for the sacrifice and went up to the mountain. And he had his hand ready to plunge the dagger in Isaac’s chest whatever… and the angel stopped him, of course, and provided a ram instead of Isaac. He brought the ten plagues and He parted the red sea and crashed in it all Pharaoh’s army of charioteers; at any rate, the Israelites came into the Promised Land as Jehovah had promised them. But it wasn’t long, they didn’t listen to Jehovah, they didn’t trust Jehovah, and about a 1,000 years after they came into the Promised Land, 10 tribes of the Israelites were dragged off their Promised Land into slavery by the Assyrians. And the Assyrian army came up against Jerusalem, they came into Judah, in fact, and they took one of the nearest cities Lakesh and King Sennacherib sent his envoy to Jerusalem and told them: “Look, just surrender, you come out, we will take you to a land, you can have your own house, your own fig trees, and all that; just give us the gold. We would rather not get ourselves all worked up in a sweat, basically, you know, killing all of you. We just want the booty anyway, just give it to us’. And Rabshakeh, his spokesman, made a very good point, he said: ‘“don’t allow Hezekiah to deceive you, claiming that Jehovah would protect you, what gods of the nations surrounding have protected their people from the king of Assyria?” And that included Samaria where the 10 tribes were, and their God was Jehovah and He did not protect them from the Assyrian army. So, he made a very good point, but Hezekiah did trust in Jehovah and he trusted in Isaiah, Jehovah’s prophet, who came to Him and said: “Do not worry, they will not shoot an arrow into the city, I will defend it.” But there the Assyrian army was, camping just outside. But you likely know what happened: Jehovah sent an angel, one angel went through the camp and they slept and they never woke up. And, by the way, the Watchtower, if you’ve not seen it, they produced a video on Hezekiah, it was shown at the 2016 convention, it is an excellent production, it’s on the JW broadcast. Well, almost 200 years later, Babylon rose to prominence, and they took out the Assyrian army and the Egyptian army at the crucial battle of Carchemish and that paved the way for Nebuchadnezzar to come down and to lay siege to Judah once again. But Jehovah’s prophet, Jeremiah, through Jehovah’s inspiration, said: “Do not put your trust in fallacious words, do not deceive yourselves saying: ‘the temple of Jehovah, the temple of Jehovah they are’’’. No, Jehovah assured them unless they did what He said and repented of their badness, which involved taking care of the widow and the orphan, whom they were neglecting (15 minute mark) unless they did that, the king of Babylon, was most assuredly going to come in and destroy Jehovah’s holy city. And that’s exactly what happened. And Jehovah still, at that point, gave them an opportunity to trust Him and to save their own lives. And through Jeremiah again, He told them simply fall away to the Chaldeans, ‘come out with your hands up’ as they say, surrender!and you can live. True, you lose your house, your possessions, you’ll have to live in a far away land, but you stay alive and your family can, your family linage can go on. No, even at that, most of the Jews refused, and even the Jews that stayed behind, Jeremiah told them: ‘’do not flee down to Egypt.’ They did. And as a consequence, Jehovah sent Babylon to Egypt and punished them there. So we see, it is really difficult for people that claim to know Jehovah and to be in a relationship with Him, to trust Him. That was the problem for the Jews, wasn’t it? In time, Jehovah’s prophets of course foretold, even though Babylon was used by Jehovah as His executioner, He would judge Babylon. And even before Babylon came to power, Isaiah foretold that in one night it would fall. And that’s exactly what happened. October 2nd, I believe, 539 B.C. the Medo-Persian army came and somehow diverted the Euphrates river, Babylon was on the shore, the bank I should say. The city was in a partying mood, they left the gates open, after they all were “impregnable,” and the Medo-Persian army came in and killed the king on that very night. And as Jehovah foretold, the Jews were released by Darius, went back, rebuilt Jerusalem, because that’s where the Messiah was going to come. By the way, it’s believed that when Abraham went up the mountain to sacrifice his son, it was in the very mountain where Solomon had built his temple. Anyway it’s an interesting point, that, (I’m back tracking here a little bit) when Abraham was in the land of Canaan and Jehovah imposed this test upon him, there’s no record that the Canaanites, the seven tribes of the Canaanites, who were notoriously immoral and worshipped all these gods, but there’s no record that they practiced child sacrifice at that time, but afterwards, when the Israelites came into the Promised Land, they were practicing it and in fact, the Israelites picked up the disgusting practice of child sacrifice. And that’s one of the reasons Jehovah had Jerusalem destroyed; He said such a thing never came up into his heart. Right, well, even the first Christians, were anointed, the 120 were anointed in an upper room in the city of Jerusalem and the apostles, they began preaching in the temple every day, it says. So, they could’ve reasoned in their own minds: ‘wait a minute, maybe, Jesus is not talking about all of Jerusalem being destroyed, because we have read in the prophets that anyone who attacks Jerusalem it’s as if they’re poking their finger in God’s eyeball. It’s going to require an instantaneous reaction. And didn’t the prophets say that the Messiah would return when his feet would touch the Mount of Olives? So, when Jesus left, he said he was coming back, surely he’s coming back to the place where he left’’, so, but Jesus said that Jerusalem would be surrounded by enemies who would build around it a fortification with pointed stakes and they would dash their children within to the ground and Jerusalem will be trampled on by the nations until the appointed time of the nations are fulfilled. So Jesus gave them explicit instructions: ‘when you see the disgusting thing that causes desolation, get out. If you’re on the field don’t come back to your house, if you’re on the roof don’t go back inside to get your garments, get out of town’. Because the Romans came and then they inexplicably left, but then they came back, and when they came back. Unfortunately for the Jews that didn’t obey Jesus or know about Him, the Romans came back on the Passover, and the city was packed with worshippers, many of whom may not even live there,came from around the Mediterranean to celebrate the Passover. And when the Romans came back they quickly —in a very few hours —put a fence of pointed stakes around Jerusalem, just as Jesus said they would. And then they were trapped and over a million souls were lost, way more than the population of Jerusalem at that time. But the apostle Paul surely knew the words that Jesus had spoken, but he also could see that the Jewish Christians were still very much attached to the Mosaic system. In fact, many of the letters that Paul wrote were showing that the Jewish system had been phased-out. But it wasn’t an easy thing to get the Christians free from that, was it? That’s why he wrote Galatians stressing that… (Romans) he taught them about Jerusalem being our mother (heavenly Jerusalem). So, he was helping them to get their minds divorced from the Jewish law, the temple in Jerusalem, so that they would be more ready to leave the city when the disgusting thing showed itself; that came in the form of the Roman armies, they entered the temple and so forth. Well, I think you can see, maybe where I’m going with this and we see the pattern of people down through history. People that should’ve known better, people that had access to God’s word, the problem is that they always put faith in what they could see. Christians should not put our faith in what we see, including a visible organization. That is surely an expression Jehovah’s Witnesses are familiar with: ‘the Watchtower Society is Jehovah’s visible organization.’ Well, what is so different about that mentality and the Jews living in Jerusalem either in Jesus’ days or Jeremiah’s days? They feel like: ‘’we have the temple of Jehovah, this is where Jehovah puts His Name, this is Jehovah’s visible organization!’’ but if they wanted to survive, they had to break with the accepted orthodoxy, they had to demonstrate their trust in Jehovah. Jeremiah was considered a nobody, an outsider: ‘this guy is not part of the Jewish establishment,’ but if you wanted to live, you better listen to what this prophet says. We know that after Jerusalem was destroyed in time, the apostles died off and Christianity became absorbed into the Roman Empire and for the most part, Christianity didn’t exist anymore. It had become so corrupted; it was like Israel before they went into exile —submerged in idolatry, superstition and all sorts of evil and wickedness. But, Jesus said when he returns there would be a harvest and there would be truthful sons and they would be co-mingled with those who were planted by Satan the Devil. In other words, those who are going live with Christ in heaven, they are the things in the heavens, the 144000 and those who are going to live on the earth, so when Jehovah brought the Israelites back from captivity to Babylon, it prefigured a restoration that would come about when Jesus Christ returns. 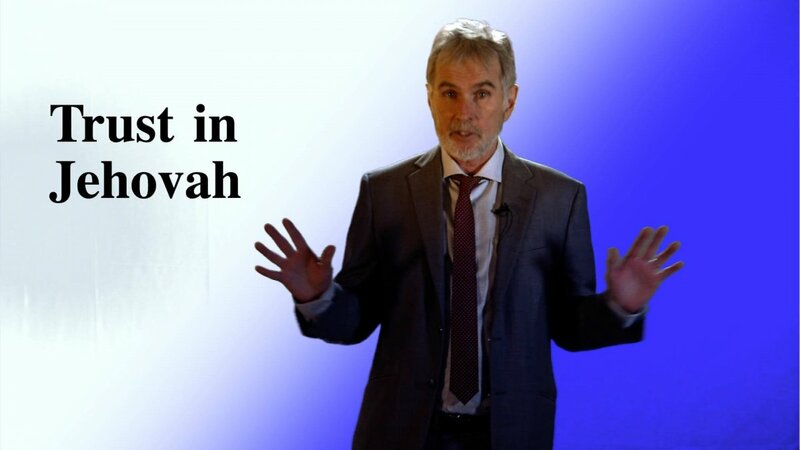 That’s why Jehovah calls Cyrus, His anointed one, literally His Messiah, and Jesus would perform a similar liberation and all the prophecies for example, in Isaiah, when the Jews came back, Jehovah referred to that as the new heavens and the new earth: the rebuilt city of Jerusalem. And it goes on to say that Jehovah would set all things straight and people would beat their swords into plowshares and nations will not learn war anymore. Jehovah’s Witnesses may reason ‘well, that has been fulfilled because Jehovah’s Witnesses don’t learn war, they refuse to be inducted into the military.’ But has that brought peace to the Earth, because a relatively small religious group has not taken up arms? That hasn’t brought peace to the earth, the nations are still warring, aren’t they not? When Jesus spoke about the disgusting thing standing in the holy place, he referred the reader to the prophecy of Daniel. There are several places that he could’ve been referring to, but in the eighth chapter of Daniel, it speaks of the desolation of the holy place and the removal of the constant feature of Jehovah’s worship and even the Prince of princes will be confronted by this political tyrant. Well, the Watchtower is well aware of this prophecy and they applied it to themselves again: the holy place that was desolated, the holy ones were brought to ruin during WWII. Of course Jehovah’s Witnesses were terribly persecuted in Nazi Germany, they were in concentration camps, some were executed, some died of deprivation, hunger, cold, and in the United States there were mob actions against Jehovah’s Witnesses. Some countries banned the literature of Jehovah’s Witnesses during that time. But, in the United States, the government actually upheld the rights of Jehovah’s Witnesses and there are several books written about the Supreme Court victories that the Watchtower had won. And in all of that, Jehovah’s Witnesses in the United States were not under ban. The point is the Watchtower has obscured these prophecies. For example, the holy place that Jesus said would be desolated by the disgusting thing is Christendom and the fulfillment of Jesus’ words will take place when the United Nations destroys Babylon the Great. But, if that’s the case though, why would Jesus say that when you see this thing happening to take action? Does it make sense that if Jehovah’s Witnesses are not part of Christendom prior to that? Really, the book of Revelation in the eleventh chapter talks about the nations trampling on the holy city and God’s sanctuary being given to them for 42 months and of course that was after Jerusalem had been destroyed by the Romans so we know it doesn’t apply to any literal, visible city, but it applies to Christ’s congregation, which is a spiritual temple. Paul, in several of his letters, said that you – speaking to anointed Christians – are the temple of God that is built up for divine inhabitation. So, the prophecies that apply to Jerusalem in the days of Jeremiah, and the Jerusalem to which Jesus was speaking the holy place that would be desolated, applies to Christ’s congregation. And unfortunately, Jehovah’s Witnesses have no inkling of this, because their faithful and discreet slave has no inkling or it or if they do, they’re not saying. But the situation is that Jehovah has set things up so that you will be required to demonstrate your trust in God apart from the Watchtower. How it’ll come about? Well, we will see. But I can assure you that everything that the Watchtower has taught as regards the fulfillment of prophecy will discredited and called into question. God wants to find out what is in your heart —if you really trust Him. It’s easy to follow men, and religious people fall into that trap all the time, and I mentioned all that instances, with the Israelites. So you’re gonna have to demonstrate your faith in a way that you’ve never been called upon to do before. And I’m convinced it is going to be soon.